Bettina, a 4-month-old possum joey, was found alone, frightened and dehydrated one September night, with her mom nowhere in sight. 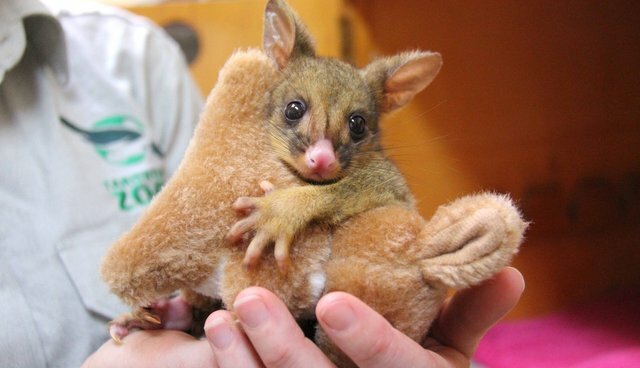 She was taken to the Taronga Zoo Wildlife Hospital in Sydney, Australia, and while it's tough to be a little possum on your own, she has one thing that helps: a cuddly stuffed kangaroo that she clings to when nursing or sleeping. "The soft toy gives her something to snuggle for comfort," staff veterinarian Felicity Evans explained in a press release. Evans, who cares for Bettina 24/7, has taken to "carrying a makeshift pouch and waking in the middle of the night to bottle feed and toilet" the little joey, who always has her stuffed animal nearby. Bettina is growing well, and as soon as she's old enough she'll began a gradual transition to her release out into the wild. But she'll probably never forget the kind veterinarian who helped raise her ... not to mention her stuffed kangaroo.